Jennifer Haigh: In drafting a novel, I give myself permission to follow every thread of story that fascinates me. This keeps the process interesting, and results in livelier, more surprising books; but as methods go, it’s hideously inefficient. Over the course of five novels, I’ve written hundreds and hundreds of pages that will never be read by anyone. My new novel, Heat and Light, looks at what happens to Bakerton, Pennsylvania when the natural gas industry comes to town, how this struggling community is transformed and divided by the sudden promise of wealth. It isn’t a book about fracking so much as a meditation on the soul of a place. It’s no accident that Heat and Light takes place in Pennsylvania. The story is intimately connected to its unique history as an energy state. The first oil well in the world was drilled there. The Three Mile Island nuclear disaster happened there. Coal companies dominated its economy for a hundred years. Each of these subjects is worthy of several novels, and my early drafts of Heat and Light include long digressions about each. Most of those pages didn’t make it into the final draft, but I needed to write them in order to understand the scope of the story.This scene is from the first draft of Heat and Light. The year is 1987, and Lorne Trexler — a geology professor at a small private college and an unreconstructed hippie — is taking his Earth Science class on a field trip to Centralia, a former coal mining town. Readers will recognize both Trexler and his student, Amy Rubin, from Heat and Light. The bus turned down a side street and parked at a cemetery. In sweatshirts and sunglasses, ponytails and ball caps, the students filed out into the street. Trexler had brought, over the years, a dozen Earth Science classes to Centralia. This group reacted as all the others had. Driving into town, only a few had bothered to look out the window. Now they pissed and moaned about the smell. The narrow street was lined with boarded-up houses, all alike: shingles and aluminum siding, peeling paint and sagging porches, a look of established poverty. The air smelled of struck matches, a car backfiring. Sometimes it smelled of bicycle tires or rotten eggs. The smell changed day to day, in response to conditions underground. The exact reasons it changed were not known. There was life here, once. There was uptown and downtown. There was an American Legion post and a VFW, a Roman Catholic church and several bars. Each December the local paper published letters to Santa. High school football was played. They were working people, not rich. They had nothing, they had everything. Parades for the patriotic holidays, the local High Steppers in their spangled costumes, silver batons spinning. The Fire Queen in her sister’s old prom dress, waving from the back of someone’s convertible. Church festivals in summertime, bingo under striped tents, funnel cakes, nickel games for the kids. There were summer weddings, a rash of them after high school graduation, the church hall decked with Kleenex flowers and bridesmaids dancing barefoot, their high heels lying in a pile near the door. They were coal miners, miners’ wives and miners’ children, until they weren’t. The town’s heyday came and went. The underground mines were abandoned, and the town limped along with a little strip mining, the traces of which were still present, razed land no one had bothered to backfill, sooty black scars as though the earth had been burned. Centralia contracted but did not disappear. Despite the privations, people found a way to stay. The town budget shrank a little every year. Soon there was no money for July fireworks, for Christmas decorations on Main Street. Trash pickup was a luxury the town couldn’t afford. Citizens could pay a hauler to take their trash to the town dump, or carry it there themselves. The dump ran along the town’s western border, a deep, gaping pit dug a generation earlier, one of the first strip mines. By the early 1960s the trash was three stories deep, decades’ worth of castoff furniture and old appliances, car parts and dead batteries, paint cans and household waste. Like all of Centralia it sat directly sat on a coal seam, called the Buck Vein, that stretched wishbone-shaped beneath the town. How the fire began isn’t hard to imagine. Every house in Centralia was warmed by a coal-fired Heatrola. An ashcan filled with soot and embers sat at every back door. Along with the usual household trash, the ashcans were emptied at the dump — atop the furniture and appliances, the car parts and batteries. Atop a seam of anthracite coal. The town officials didn’t panic. A fire at the dump wasn’t unusual. The volunteer firemen sent a pumper truck to wet the garbage down. When the fire kept burning, they sent a bulldozer to dig through the landfill and expose the fire. The pumper gave the flaming trash a good soaking. Then the firemen went home. The fire smoldered but did not extinguish. Instead it traveled underground. It would have petered out eventually, suffocated by tons of earth, if it hadn’t found its way to the mine. A mine — open space, a series of empty rooms — has oxygen, necessary for combustion. 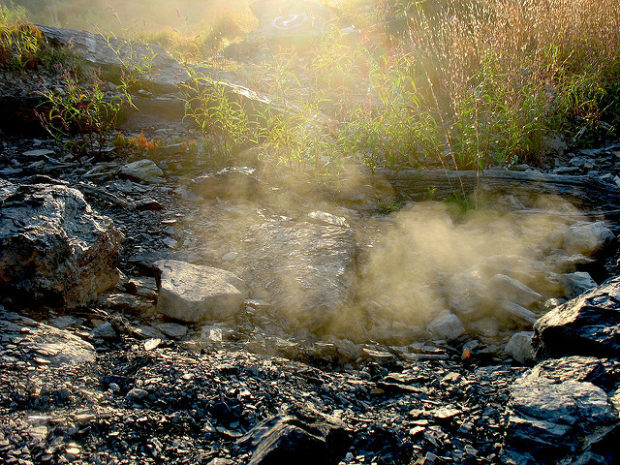 The old Centralia Colliery mine was an immense man-made furnace, lined with anthracite coal. Coal burns and burns, endlessly, reliably. This is the entire point of coal. Underground, the fire raced along the Buck Vein. Aboveground, the people of Centralia noticed a peculiar smell. Rotten eggs, bicycle tires. The fumes drifted across Locust Avenue and into St. Ignatius Church. For eight weeks fire raced along the coal seam. Finally the borough council notified the state. They were vague about when and how the fire had started. Spontaneous combustion, the state inspector was told. The fire burned and burned. Centralia wasn’t the first underground fire in Pennsylvania. It was a known hazard of coal mining: Far in the hole! The old coal barons had fought such fires aggressively, to protect their investment. They flooded the mines with water, or dug the burning seams clean out of the ground. But the Centralia mine was long abandoned, dug in the last century by a company long bankrupt. It was nobody’s problem now. “The worse part,” Trexler told his students, “the real tragedy, is that none of this had to happen. It could have turned out differently.” If the town officials had acted quickly, and notified the state Bureau of Mines. If government – local, state and federal — had brought its resources to bear. He was silent for a moment, long enough to make the students uncomfortable. It was, to Trexler, a moment of transcendent beauty: a voice – at last! — ringing with the clarity of youth, its righteous indignation. Youth ought to love nothing better than passing judgment, the invigorating pleasure of moral outrage. “So, wait. They could have prevented it, if they just did what they were supposed to do?” said Suki Lee. Trexler spread his open hands. “So they were covering their asses,” said Scott McKotch, Trexler’s favorite burnout, a pot-addled kid who came to class red-eyed and dreamy, when he came at all. Snorts from the frat boys: Earth Science, considered a gut course, attracted more than its share. They greeted Trexler’s political rants with loud derision. Trip Dingman, a standout on the golf team, began whistling. In the front row, Suki Lee rolled her eyes. To be nineteen years old and admit, without apparent self-consciousness, a fondness for golf. The town burned and burned. The rest of the students were silent. Beneath their feet the fire was unstoppable, raging out of control.